But don’t let same-looks fool you. We think this new version is superior. Indeed, it was the best ever. [This is a] delectable and attractive shortbread, flavored with ingredients local to southern Yunnan: poppy seeds and green tea. The recipe calls for butter, but in Yunnan lard is the more available and local shortening; substituted lard for the butter if you wish. […] The tea gives the rich sweet shortbread an enticing bitter edge. Hmmm… “delectable and attractive”, eh? I was certain that I had taken photos of that green tea shortbread! Alas, after searching and searching, I cannot find any sign of even one blurred photo of the cookies in my mixed-up files. What a shame. As I recall, they were quite spectacularly ugly to look at: a sort of grey-green colour, mottled with the grey blue of the poppy seeds. Unsurprisingly, there is no photo of the cookies in Alford’s and Duguid’s cookbook filled with gorgeous photo after gorgeous photo. 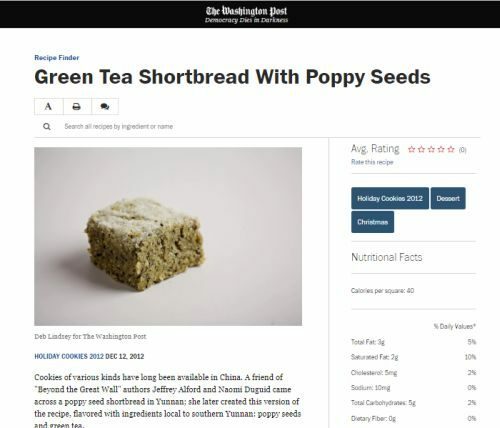 And you can sort of see why when you look at the photo of the shortbread in the December 2012 article (with recipe) that appeared in the Washington Post. Use your hands to pat the dough into an ungreased jellyroll pan. Pierce through at frequent intervals with a fork. Bake at 250F on the uppermost shelf of the oven for about 50 minutes – until the bottom is golden but not dark. Remove from oven. While they are warm, use a straight edge to cut the shortbread into small rectangles. Imagine serving them at a tea…. Standing the rectangles on their sides with plenty of space between each rectangle (use a couple of cookie trays) and bake at 175F (note that the oven is set at a lower temperature) for another 30 minutes. They should be beautifully uniform golden coloured everywhere. Leaving them on the tray, cool the cookies completely and then taste to make sure they’re crisp. If not, stick them back in the oven for a few minutes longer. Allow the cookies to cool completely before storing in a tin. These keep well for about a month. When we were admiring our friends’ brand new kitchen with its induction stove, they gave us this wonderful fridge magnet, because their new fridge door won’t hold magnets(!!) We had been raving about our tagine and commiserated with them that they might not be able to discover its wonders in their kitchen. But when we got home, we tested the cat magnet on our heat diffuser. And look!! A tagine CAN be used (with a diffuser) on an induction stove. And speaking of magnets, as I was tidying the shelves of Christmas decorations, I came across our boxes of Magnetic Poetry tiles, and realized that it has been FAR too long since we played a round! As I’m sure everyone knows, April is National Poetry Month, and November is National Novel Writing Month. Both are simply awesome. So I am officially combining both ideas and announcing that April is herefore Refrigerator Poetry Writing Month. I really don’t care what month it is. I don’t care if it’s Poetry Month or not. Any month is good for playing Magnetic Poetry! Here’s how to play: Choose twenty tiles randomly and then everyone creates poems using the same words. (We always hide our final poems until everyone creates their poem(s).) You do not have to use all the words at once. Make as many poems as you like with the tiles. The only rule is that each tile can only be used once. Ready? I hope so. I hope so! Of course you will want to compose your poem before seeing what I did. Here is my poem from the above words. » aren’t fridge magnets wonderful? This was a tough one. I haven’t looked at yours yet, but I bet you managed to use all the words. Your poems were excellent also. I was kind of relieved that you hadn’t managed to use all the words.